Delvalle launch a new range of ATEX & IECEx motor starter, The Ex motor protection has been designed to get in one device the ability to protect one electric tri-phase motor in zones with explosives atmospheres and to start and stop that motor. As internal component it just has one motor protector, which protects the motor against heavy electric problems, like short-circuits, overloads and motor or circuit phase failures. It has a selector, the only one control component. It starts the motor with ON position (1) and stops it with OFF one (2). The design has been made on a waterproof and antirust enclosure with AISI 304L stainless steel. This design way allows us to use this device in protected spaces with high explosion risk, getting this manner, the “Ex e” and “Ex d” protection types in potentially explosive atmospheres of dust and gas. It can be used in any industry considered as an industry with explosive atmosphere in dust or gas places, like be oil & gas, chemistry, petrol chemistry, petrol, offshore industry, etc. This Ex motor protection’s design avoids placing fuse to protect the electrical line against short-circuits or over loads. Thanks to this device, the motor useful life will be longer, because it’s protected against many electric problems. 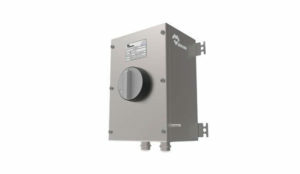 The enclosure can be manufactured with AISI 316L stainless steel.